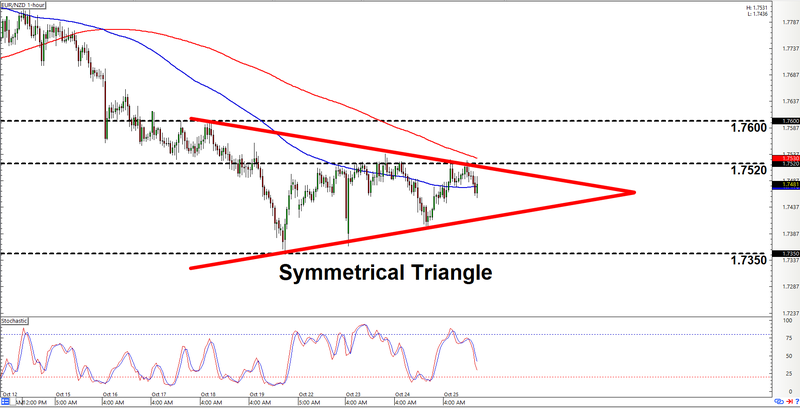 If trading breakouts is your thing, then you may wanna check out today’s intraday charts update ‘coz I found a couple of triangles on EUR/NZD and GBP/NZD. Looks like price action on EUR/NZD is consolidating while tapering into a point, forming that there symmetrical triangle in the process. And as most of y’all probably already know, a symmetrical triangle means that bulls and bears are roughly balanced, so the pair could break in either direction. It would therefore be prudent for y’all to prepare for both an upside breakout scenario, as well as a downside breakout scenario. Looking at our technical indicators, however, we can see that them moving averages just currently in downtrend mode, so a downside breakout seems like a more probable scenario. Also, selling interest at 1.7520 seems rather strong. As for key price levels to watch before y’all can chillax after a breakout does occur, 1.7600 is the price area to watch for an upside breakout, although a strong move higher past 1.7520 would be an early sign that bulls are winning out. A downside breakout, meanwhile, needs to smash lower past 1.7350. GBP/NZD has been trending lower lately. However, the downtrend stalled when the pair encountered support at 1.9720. Them bears ain’t ready to give up just yet, though, since they have been pushing the pair back down every time the pair tries to climb higher, resulting in ever lower peaks. And if we connect those peaks, we can see that a fresh descending triangle pattern appears to have formed. 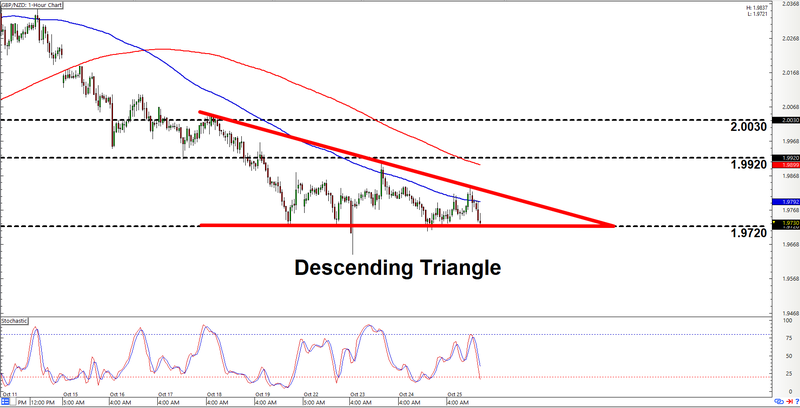 As the name implies, a descending triangle is mainly a bearish pattern, so we’re also mainly bearish on the pair. And the name of the game is to wait for the pair to smash lower past 1.9720, ideally on strong bearish momentum. Do note, however, that there’s always a risk that the pair may break to the topside instead. And a move past 1.9920 is the earliest sign that bulls are winning out. The pair would still need to clear 2.0030 in order to confirm the topside breakout, though. In any case, y’all just make sure y’all remember to practice proper risk management as always, a’ight? Peace, out!